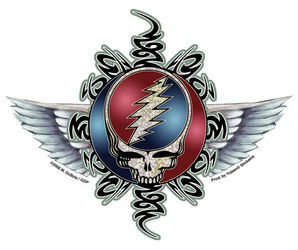 Newest incarnation of Steal Your Face--gray feathered wings and tribal designs back the classic skull and lightning bolt. 5.5"x4.5" die-cut sticker. Designed by poster artist Mike DuBois. officially licensed Grateful Dead merchandise.